I homeschooled my children for three years. To quote someone who described my homeschooling experience so perfectly, "It was the best of times, it was the worst of times...."
For those of you who homeschool, I'd like to share a resource with you that will be a blessing. And while I'm on the subject, I wish you more of the best of times than the worst, and many homeschool reads through great literature with your kiddos. 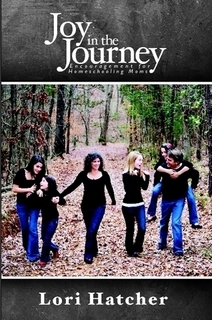 Joy in the Journey: Encouragement for Homeschooling Moms by Lori Hatcher is a unique devotional written specifically with the homeschooling mom in mind. These weekly devotionals are crafted to carry you right through the school year, beginning in August and ending in May. Lori comes alongside you to support your homeschooling journey but also allows you to peek at hers. It is an open and honest look at the successes and failures of Lori’s homeschooling experience with lessons and encouragement found in both. “Sometimes it’s easier to examine our own lives through someone else’s. I am willing to be that lens.” (Joy in the Journey, 73). She begins the year with a charge to keep your homeschooling focus a spiritual one and ends with thanking you for the many things you did as a homeschooling mom that went unappreciated. This devo packs in practical advice for homeschooling, such as why homeschooling is hard, what to do when you struggle, how to handle being behind schedule, and how to overcome discouragement. Joy in the Journey also gives spiritual perspective to the homeschooling experience. Through the lessons Lori learned firsthand during her 17 years of homeschooling, she shows you how to persevere, how to teach your children to love, how to have a horrible homeschool day, and how to finish strong. Lori’s insight helps you keep your perspective, find joy in the academic and spiritual lessons, and remind you to laugh a little along the way. Joy in the Journey will give you permission to reset your expectations, redeem second semester as a second chance, and remind you to pursue the standard of grace in lieu of perfection. If you are in need of encouragement and camaraderie, both practical and spiritual, as a homeschooling mom, you’ll find it here. To learn more or purchase a paperback or ebook, click through to Lori's site.